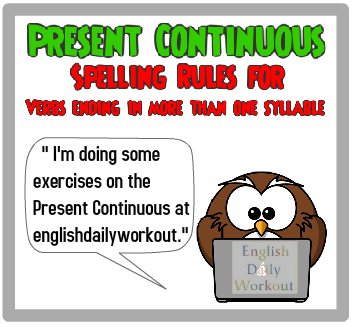 When a verb of more than one syllable ends in a single consonant other than w, x or y preceded by a single vowel, the final consonant is doubled to form the present participle only when the last syllable of the verb is pronounced with the heaviest stress. If necessary, a dictionary can be consulted to determine which syllable of a verb has the heaviest stress. Many dictionaries use symbols such as apostrophes to indicate which syllables are pronounced with the heaviest stress. Each of the following sentences is preceded by a bare infinitive, the most heavily stressed syllable of which is underlined. Paying attention to whether or not the final consonant should be doubled before ing is added, fill in the blanks with the present participles corresponding to the bare infinitives. Use the American spelling for verbs ending in l.
whisper: They are __________ to their friends. They are whispering to their friends. refer: I was _________ to your letter. I was referring to your letter.